Now you can attach meaningful and relevant content to your spaces and cases, and then discuss that content and collaborate with other users by using Pulse. Add varied content to your case or space by using the Recent content gadget. 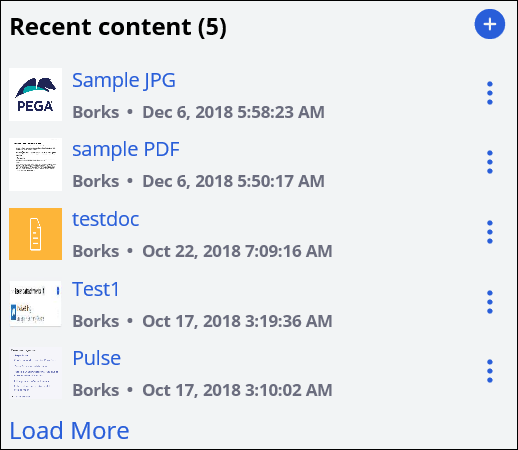 With this gadget, you can create documents by using a rich text editor, upload files, include URLs, and attach files from other cases or spaces in your portal. You can add any type of file. Add relevant documents from external repositories that you configure in your system. Now you do not have to download a document and upload it to your portal; instead you can attach content directly from an external repository. Manage your content by granting access to documents only to the members of a specific space or case. Include only relevant content to foster more focused communication and collaboration between users. By adding meaningful content to your portal, you can collaborate with other users to exchange useful information and feedback. For example, you can discuss an order from a client with other members of a case. You can post Pulse comments more quickly by replying to a notification email without logging in to the portal. You can also download documents as PDF files, and share documents by using shareable URLs. For App Studio: Adding content to a space, Creating a document. For Dev Studio: Adding content to a space, Creating a document.